The delivery company DHL turned up on my doorstep a few days ago with an unsolicited and unexpected package addressed to me. A massive 5kg in weight, it proved to contain two volumes of a pronunciation dictionary from RAI, Radiotelevisione Italiana, entitled Dizionario italiano multimediale e multilingue d’Ortografia e di Pronunzia, or DOP for short. I imagine I owe this honour to the fact that in the Foreword to LPD I acknowledged the help I had gained from an earlier (and much smaller) edition of this work. With 133 pages of introduction and 1253 pages of dictionary proper — large pages, almost as big as A4 — it’s an enormous work. And this is only the part devoted to Italian: there’s also a promised third volume, not yet available, to be devoted to words belonging to other languages. The two volumes already published are claimed to cover 92,000 voci di lessico e nomi propri della lingua italiana [Italian lexical words and proper names]; the third will cover 37,000 nomi propri e altre voci d’una sessantina di lingue diverse [proper names and other words from some sixty different languages]. All this despite the fact that the pronunciation of Italian words is mostly pretty predictable from the spelling. The chief uncertainties are the placement of the stress in longer words and one or two other things that I discuss below. In the face of the publisher’s generosity in sending me a complimentary copy, it may seem churlish to look a gift horse in the mouth: but nevertheless here goes. Why oh why don’t they use IPA? Instead, they use an idiosyncratic mishmash of a transcription system, of which I reproduce a small part here. At the very least, this makes the dictionary difficult for non-Italian phoneticians to use. Instead of seeing the familiar IPA symbols that we use for the tens or hundreds of other languages in whose pronunciation we may be interested, we have to contend with this set of strange symbols found nowhere else. Not only does DOP not use IPA, it applies familiar IPA symbols in unusual meanings. Thus for example ʃ is used for the voiced alveolar fricative (IPA z). The sound represented in IPA by ɕ, the voiceless alveolopalatal fricative, is shown in DOP as s’, which in IPA would be an ejective alveolar fricative. And so on. You can sort of see the logic behind this. In Italian orthography the letter z stands for an affricate, either ts or dz. So Italians without phonetic training might be confused if a word such as caso ‘case’ were transcribed as IPA ˈkazo. Writing it as [kàʃo] draws the attention of the naïve reader to the fact that there’s something special about this s (compare casa ‘house’, where the fricative is voiceless). However, the millions of Italians who study or have studied English will be familiar with the use of IPA transcription for English, with ʃɪp standing for ship, busy transcribed ˈbɪzi and so on. And precisely the same arguments would apply in Germany, which hasn’t inhibited the Duden Aussprachewörterbuch and other German pronunciation dictionaries from using IPA. Then there’s Wikipedia, which insists that its authors use IPA rather than other possible phonetic alphabets or ad-hoc solutions. The phonetic terminology is flaky, too. You can see from the above sample that ‘voiceless’ is rendered as aspro [harsh, sharp], while ‘voiced’ is rendered dolce [sweet]. The standard Italian terms are added in brackets. I wonder what it means to say that English/Spanish θ, symbolized by DOP’s special barred th symbol, is found in varie sfumature [in various shades]. At the end of the symbol list (not shown above), Arabic ‘ayn, IPA ʕ, is defined as faringale, ossia profondamente gutturale [pharyngeal, or rather deeply guttural]. And that’s it. Would it be voiceless or voiced? a plosive, a fricative, or an approximant? Or perhaps it’s a nasal or a lateral? OK, we can leave it to the specialists to argue whether it’s best described as epiglottal rather than pharyngeal, a pharyngealized plosive rather than a fricative or an approximant; but I wouldn’t let even an undergraduate get away with no attempt at all at a full VPM label, let alone the author of a work for publication. Are you sure they haven't sent you the galley proof for editing? The two volumes are very sturdily bound and beautifully presented. The first Italian grammar book that I ever looked into (name and title forgotten, but it was much older than I) did everything with underdot: under e and o, it meant "tense", and under s and z, it meant "voiced". I think the book also used grave to mark all non-penultimate stress, while explaining that Italian normally marks only ultimate stress. The voicing story, at least, seems to be that the North has the typical intervocalic voicing of Western Romance, whereas the South has pervasive voicing (with lexical exceptions in both directions), so the standard is a mish-mosh of voiced and unvoiced that in practice everyone ignores. In a very small number of entries variants are shown - perhaps one entry in every five pages or so. For example, batavo is shown with initial stress plus "raro" penultimate stress. The name Bazzi can have either ddʒ or ddz. There is some discussion in the introduction. The contrast between /s/ and /z/ only applies between vowels in the same word. (There's only /s/ before voiceless consonants and when geminated, only /z/ before voiced consonants, and only /s/ before vowels at the beginning of words.) The lexical load of it is practically zero -- there are approximately two minimal pairs between them of words I use more often than once per decade. And for practically all speakers outside Tuscany the contrast is dead: everywhere else speakers use only /s/ (in the south), only /z/ (in the north), or freely variate. As for the contrast between mid-open and mid-closed vowels, Sabev said it all. The DOP is based on the traditional Tuscanian pronunciation even including features of it which are used nowhere else: for example it says da triggers the gemination of the following vowel but I don't recall having ever heard anyone outside Tuscany pronounce da Vinci with /vv/. I've read harsh criticism of the DOP by Luciano Canepari, and even he is somewhat too prescriptivist for my tastes. for "everywhere else" read "everywhere else, between vowels". The voicelessness in initial position and the assimilation of voicedness before consonants is followed pretty much throughout Italy, and only between vowels speakers differ. John, impeccable post as ever! There's just one little thing: "RadioteleviSione" is written with an 's', not a 'z'. For a discussion of prescriptivism in Italian pronunciation dictionaries, see my blog at http://alex-ateachersthoughts.blogspot.com/2010/06/zoo.html. alex: sorry, my mistyping. Now corrected. Like John, I’ve been exasperated for years when having to deal with the uniquely tiresome set of symbols of the RAI dictionary and deplore its perpetuation in this new work. I suspect that Piero Fiorelli the original junior collaborator now presumably the senior one, who has been, or at least was until a few years ago, a regular supporter of the IPA, may well have been outvoted on a proposal to use the IPA alphabet. I do feel that John is being a little unkind in his translation of ‘dolce’ as applied to consonant pairs differentiated by voicing etc. The word has a different range of applications in Italian from those of our word ‘sweet’. As cover terms for the two types I find ‘sharp’ and ‘soft’ perfectly acceptable and indeed they are my preferred terms of reference in general parlance for the corresponding pairs of phonemes in English. I’m afraid I’m inclined to query the statement “The name Bazzi can have either ddʒ or ddz”. Surely it shd read “can have either tts or ddz”. The parent work had only tts. As for the book’s prescriptivist clinging to a sort-of de-localised Florentine “model”, I shdnt want to join in any complaints from here with our none too complete harmony about a “received pronunciation”. Sorry, yes, battsi or baddzi. It's those unfamiliar symbols! "The IPA, first published by the International Phonetic Association in 1888 and revised many times since then, is accepted as the standard phonetic alphabet almost universally except in the United States, where it is only slowly gaining acceptance" (Andrew M. Colman, 2009). The IPA is potentially an extremely powerful tool, but much of that potential is going unrealized. I considered the course that I took in phonetics and phonology to be valuable, but it would be far better if the IPA were linked to an Internet set of 50 carefully chosen lyric poems from 1600 to 1900 so that the sound system(s) of English could be taught in context. I would choose Shakespeare's sonnet 97 as the first fascinating case--how do specialists in linguistics (phonetics) think about the sound patterns in this poem? In fact, there is no absolutely powerful description of sound symbolism in "Macbeth" or "Hamlet," for that matter. Routinely, in introductions to editions of these plays, what could be the contributions from phonetics and phonology are effectively absent (a prime example is in the new (third series) Arden "Hamlet," a lapse there compounded by the odd sound indifference in some of the editorial choices). If I were a barn owl, I might make a comment on it. Due to my Heimdallr sensitivity. If (As if) I had it. As a recreational learner of Italian, I had to struggle to find a bilingual dictionary that included IPA for all the Italian words. I eventually got a copy of the large, hard-cover Harper Collins College version. Just as a side-note, I've noticed that there appears to be a style of operatic Italian (and Church Latin) in which /e/ and /ɛ/ are merged as [ɛ], and /o/ and /ɔ/ as [ɔ]. Pavarotti appears to have done this, as best I can tell from YouTube. I'm, with professor Piero Fiorelli, one of the two authors of this new edition of the "DOP". May I say a few words? 1) "Why don't we use the IPA?" Both Fiorelli and I hold the international phonetic alphabet in high esteem, and do acknowledge its merits and usefulness. 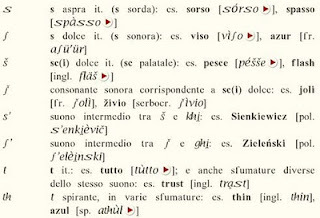 Fiorelli was the first, I think, to use it on a large scale in Italy when he gave (with I. Calabresi) the phonematic transcription of all the entries in the tenth edition of the Zingarelli dictionary (1970). The alphabet we use is, with some modifications, the one that was originally contrived by Bruno Migliorini and Piero himself for use in the "Dizionario enciclopedico italiano" (now the "Piccola Treccani"). Our judgement about a transcription system should be, I think, a relative one: it depends, in particular, on one's targets and aims. In your admirable "LPD" you write (p. xvii): "This is a specialist dictionary". That's why I find your complex notation, and transcribing conventions, very appropriate: it makes your entries unusually rich, stimulating and thought-provoking. Furthermore, you wrote for foreigners no less than for English-speaking consulters. The "DOP" was written chiefly for the Italian-speaking general public. Provided that the basic scientific principles that must govern a transcription system are observed, I think we should allow a reasonable freedom, as far as the shape of the symbols, or other more technical particulars, are concerned. After all, the IPA is not a matter of faith! Mr Windsor Lewis: professor Fiorelli is indeed a supporter of the IPA, as I said, but he's also the main author of the "DOP" alphabet. Nobody has ever been "outvoted", and there's always been agreement among the four authors of the (old and new) dictionary. As for the phonetic terminology, I agree with Mr Windsor Lewis that using some impressionistic, less technical terms "in general parlance" does no harm – provided they are clear and unambiguous. In the entries themselves we always use the labels "sordo" ("unvoiced") and "sonoro" ("voiced"); the words "aspro" and "dolce" are only added in this introductory section, for the convenience of readers who might be more familiar with them: is it a mortal sin? I'm sure it isn't, since you yourself use the labels "hard" and "soft G" (see, in "LPD", for example p. 329; in Italian, "g duro" and "g dolce"). 2) I don't subscribe to your opinion that the "DOP" has a "strongly normative nature". I would rather admit that it shows a reasonable respect for tradition, and a certain taste for both literary and popular (standard) language: a respect, and a taste, that I'm sure you share with us. But its main characteristic is, in my opinion, its critical perspective: we do not only ascertain and register facts (linguistic usages); but, in addition to doing that carefully (Piero has been making enquiries for a lot of years, and we've sent thousands of postcards to prospective informants), we often discuss the different forms (and especially those that are more frequent in the speech of educated central Italians) from both a historical and a structural point of view. There is a high number of often rather long notes: so, the reader can reflect and decide which pronunciation (or orthographic form) he finds is the better, or he prefers. As for the opposition of /s/ and /z/, you're quite right that this is a problematic point: it is discussed in the introduction, at pages LIV-LV (in a chapter dealing with "The reference norm, and contemporary trends"). Here I can only mention that even Northeners (like me) use /s/, more or less regularly, in compound words. The distinction between the two Es and the two Os (p. LIV) is much more vital – there is considerable regional variation, but then it's always been so. The "raddoppiamento sintattico" (as in "appiè della croce"; p. LVI) is well alive, too (though it's not traditionally known in the North). Sorry! I said I would only say a few words, and I haven't! I might say a good deal more about the "DOP", but I'll stop here. Thank you for your comments: both for what you liked and for what you didn't. I see your point about the usability and the danger of alienating laypeople. Was using a simple system of diacritics an option? As John Cowan, I too have seen dictionaries that use underdots for closed vowels (or ę &c. for the open ones), accents for stressed syllables other than the penultimate and underdots again for voiceless esses and zeds. Was the more complex system needed for non-Italianised foreign words? From a purely typographic point of view, the wide 's' symbol for the unvoiced [s] looks like an ordinary 's' that was simply horizontally stretched, and is rather ugly. I agree a system of diacritics like underdots may have been more elegant, from a typographic standpoint at least. Would it have made sense to provide both an idiosyncratic phonetic respelling for the general Italian readership and the IPA for those who would be better served by it? The Oxford BBC Guide to Pronunciation does something similar. For people who aren't so used to the IPA, the "long s" is a good choice for [z], I think, given that historically it was often used intervocalically, which in not a few Germanic and Romance languages and accents actually was [z]. Anyway, the association tends to be one of alveolar rather than post-alveolar sounds for educated laypeople. I just can't see why the DOP should only be used by Italians. What are foreign learners of Italian supposed to consult then? After all, there are not many pronouncing dictionaries in Italy (I have the one by Luciano Canepari which does use IPA but is rather prescriptive and does not show accurately how words are really pronounced by Italian speakers!). In accordance with Jongseong, I think it would have made sense to provide both a phonetic respelling for the general Italian public and the IPA notation for foreign learners of Italian. Thanks to everybody, and sorry for not having been able to answer before. Lipman: general Italian dictionaries normally use (for headwords) the ordinary spelling with the addition of a few diacritics or other signs to show pronunciation, such as grave and acute accents for open and respectively close Es and Os, underdots (or special long, tailed, letters) for voiced esses and zeds, etc. This is all right. But the "DOP" has always used a phonetic transcription (among square brackets), with a special phonetic alphabet (not a "respelling"!) This is clearly necessary for foreign words, but also permits to show some important subtleties of Italian pronunciation, particularly in sandhi (I'm thinking for instance of the assimilation of nasals before other consonants, or of stress shift in sentences). Underdots and small tails ("ę", "ǫ" = IPA ɛ, ɔ) are traditionally often used, in Italy, by many Romance philologists and dialectologists. But, since accents and other signs must often be added too, both above and below the basic letters, the results are usually awkward, and transcriptions of this kind are sometimes hardly readable. Alex: I didn't say that the "DOP" has been conceived "only" for Italian-speaking people, but "primarily, though certainly not exclusively" for them. Foreign learners of Italian are very important indeed for us. But I think we're entitled to ask them an effort to learn a few new signs and conventions: an effort that may be tiresome for some but I suppose isn't too great, after all. Students and learners of foreign languages are usually (or should be) more linguistically sophisticated, curious and motivated than the general public. Jongseong, Alex: thank you for your suggestion. It's a very good idea, and we have in fact planned to do so, if not in the book in the online site: we hope we shall be able to create an automatic device that allows consulters to shift, if they wish, from the "DOP" alphabet to the IPA. Why should foreign learners of Italian make an extra "effort"? I think clarity and straightforwardness in pronunciation dictionaries are really essential: phonetic/phonemic transcriptions should then be kept as simple as possible. Unfortunately, the bottom line is that most language students don't want to get confused with strange symbols or diacritics - and that's one of the reasons that they never use pronouncing dictionaries! I've been teaching English phonetics and phonology for some time now and I know how difficult it has been for my students to learn all those IPA symbols. Teaching Italian pronunciation to non-native speakers by means of another alphabet like the one you have devised, I think, would make things even more complicated. Really, you should consider using IPA as well! thanks. I can see your point, and we'll certainly consider every useful improvement, both for the book and for the website, carefully. But may I say that I think the "DOP" alphabet IS clear and straightforward? It is also easy to learn: to read the transcriptions of Italian words, sentences and passages one has only to know some 20 new signs. Is this an excessively hard task? Some 20 new signs? Sorry Mr Borri, but I stick to my guns! This discussion is starting to resemble the endless disagreements at English Wikipedia over how and whether to use IPA for English pronunciations. Readers of this blog may find some of it interesting. If you are looking for info on a greatgeneral dentist long beach then you need to do research and find the one that works for you. Thanks for the post.